Some things in life are inevitable – you cannot avoid them despite your best efforts and care. Sustaining serious injuries can be one of the most devastating events for a person. Catastrophic injuries can permanently alter a person’s life. One of the most catastrophic injuries is spinal cord injuries. Spinal cord injuries involve discolorations, severing, fractures and/or other kinds of damage to the spinal cord. This may result in conditions like partial paralysis, quadriplegia, and paraplegia. The severity of the injury’s impact will depend on the nature of the damage to the spinal cord. A person can suffer from an incomplete spinal cord injury or a complete spinal cord injury. In case of an incomplete injury, there may be some type of mobility or sensation available below the injured area. The victim can partially or fully recover after from an incomplete spinal cord injury. However, if a person sustains a complete spinal cord injury, recovery will not be possible. They will suffer a loss of function and immobility below the injured spinal cord forever. Besides initial trauma, those with spinal cord injuries may also experience other complications like respiratory problems, neurogenic shock, pulmonary problems, pneumonia, and inflammation of the spine, among others. They may require surgeries, intravenous fluids, drugs, and other intensive treatments. Once stabilized, they’ll generally go through a long recovery period involving continual and extensive rehabilitative treatment. Physical therapists, psychiatrists, neurosurgeons, and other specialists may be required for treatment and to help the victim recover. As discussed, a person can suffer a complete spinal cord injury or an incomplete spinal cord injury. Paraplegia and quadriplegia are complete spinal cord injuries. A triplegia victim suffers some degree of paralysis in their four limbs – the arms and legs. The degree of paralysis may vary depending on the nature of an injury, the severity of the injury and often on factors that haven’t been understood yet. Most doctors now use the term ‘tetraplegia’ for denoting this injury. Quadriplegia can be extremely severe and it can interfere with the victim ability to breathe. Paraplegia victims are able to use both their arms but their legs are disabled to a certain degree, depending on the injury. Some paraplegic victims cannot move their legs at all. Others only suffer minor mobility problems, tingling in legs or decreased sensation in the lower body. Incomplete spinal cord injuries are less catastrophic. These include anterior cord syndrome, central cord syndrome and Brown-Sequard syndrome. With anterior cord syndrome, the victim will experience difficulty with movement. The central cord syndrome injury occurs when the spine’s central area is damaged. The victim’s arm may be paralyzed and they may suffer a partial loss of functioning in their legs. Loss of fine motor skills can also result from central cord syndrome. In Brown-Sequard syndrome, one half of the spinal cord is damaged. This can lead to loss of proprioception, paralysis on the injured side and loss of pain on the opposite side. Auto accidents are the major cause of spinal cord injuries. Statistics show that 50 percent of all spinal cord injuries result from automobile accidents. Although rare, spinal cord injuries can also result from acts of violence. Older people often become a victim of spinal cord injuries when they fall or slip. Spinal cord inflammation, infections, arthritis and cancer can also lead to spinal cord injuries. Furthermore, playing sports like football and basketball can lead to a spinal cord injury. After a catastrophic event like a car, motorcycle, or bicycle accident, the victim may experience numbness, back pain and other symptoms of spinal cord injuries. Oftentimes, X-rays of the injured areas are taken at the emergency room to determine the kind of treatment required. The problem with X-rays is that they can detect only the hard tissue injuries like fractures. If a person experiences symptoms of a spinal cord injury, they should seek consultation with an orthopedic doctor. Most often computerized tomography (CT) or magnetic resonance imaging (MRI) scans can identify spinal cord injuries. Despite being the dominant species on the planet, human beings remain one of the most fragile creatures. A part of our anatomy that proves this statement is the spinal cord. Unlike the other parts of our body, the spinal cord is extremely sensitive to injuries and lacks the capacity of restoring itself to a healthy condition once it’s injured. In America, about 12,000 cases of spinal cord injuries (SCIs) are reported each year. If not treated, these cases could lead to quadriplegia paralysis, which involves legs and arms. A patient can recover from some spinal cord injuries, while there are certain spinal cord injuries from which recovery isn’t possible. In this post, we’ll share a lowdown on how spinal cord injury patients are cared for after the injury and the treatment options available for them. Once a person gets injured, it’s important to first stabilize their breathing, spinal column, and blood pressure. Most of the times, cervical neck collar and a backboard are used by first responders. If they suspect that a person has suffered a spinal cord injury, they’ll move the patient to a Level-I Trauma Center where high level of surgical care will be provided to the patient. During the first few days of hospitalization, different medications might be used for controlling the extent of damage to the patient’s spinal cord, treating the infection, alleviating pain, and dealing with other complications related to the SCI. Neuroprotective therapies are aimed towards reducing or stopping the immediate response of the body to the injury. This may cause more damage to the spinal cord. A steroid drug called ‘Methylprednisolone’ is commonly used after the injury to improve recovery and reduce inflammation. The extent and level of the spinal cord injury are determined by physicians using MRIs, CT scans or x-rays. A neurological examination will also be performed to measure muscle tone, sensation, and reflexes of the trunk and all the limbs. The results of this examination will then be reflected in the American Spinal Injury Association (ASIA) Impairment Scale – a tool used for classifying the SCI into different categories. Once the injured patient is stable, they’ll meet a surgeon to decide on surgical interventions. There are many reasons surgeons may recommend a surgery such as for removal of foreign objects, bone fragments, herniated disks, blood clots, spinal tumors, fractured vertebra or anything that’s compressing the spinal cord. Surgery may prevent future deformity or pain. Decompression or laminectomy is a surgery used for removing the lamina (back part of the vertebra) that covers the spinal cord. Removal of the lamina opens up the spinal canal to take the pressure off of nerves and spinal cord. The success rates of laminectomy are roughly 80 percent. It may alleviate radiating symptoms like weakness, tingling, numbness and burning in the legs. The success rates of decompression in the long-term are better than conservative management. Another procedure used for the treatment of spinal cord injury is vertebroplasty. In this procedure, the vertebra is injected with bone cement. Kyphoplasty is a similar treatment in which a small balloon is used to lift broken fragments of the bone and move them in their correct location. It is important to note that neither of these procedures has been shown to be better than conservative care. Moreover, there’ve been cases where fractures resulted below and above the surgical site because of these treatments. Another surgical procedure is discectomy which is used for removing a disc’s central part that may be pressing against a nerve or spinal cord or may be herniated. Discectomy shows a success rate of 80 percent. Spinal fusion surgery is aimed to prohibit motion at painful segments of the spine. Fusion occurs through a bone graft. The bone craft causes two vertebral bones or more to grow into one together. Bone graft may be harvested from the hip of a patient themselves. Fusion surgery doesn’t have a good success rate and complications can result from the procedure. After the surgery, the patient will usually go through a rehabilitation program with a team of specialists and therapists. Physical therapists aim to strengthen and maintain the existing function of muscle while rehab psychologists, occupational therapists, and others help a patient learn new skills and perform basic tasks. Modern technology available nowadays may give some independence to people living with a spinal cord injury. Assistive equipment for spinal cord injury survivors includes computer adaptations, wheelchairs, electronic aids, and electrical stimulation. An experimental technique, epidural spine stimulation has helped a number of spinal cord injury patients regain the ability to flex their ankles and toes. In some studies, researchers have used robotic exoskeletons for rehabilitation. These have allowed some patients to stand upright and sit. Damage from spinal cord injuries is irreversible, but there’re treatment options available that can mitigate complications and make life somewhat better for the spinal cord injury survivors. Immediate medical care and proactive aftercare are absolutely vital to combat the effects of spinal cord injuries. If you or someone in your family faced a spinal cord injury, you will likely have to pay hefty medical bills for treatment. Moreover, you might not be able to work temporarily or permanently after the injury. If the spinal cord injury resulted from someone else’s negligence, you can file a personal injury claim against them to receive compensation. In a personal injury lawsuit, you may be able to recover medical bills, pain, and suffering and lost wages. 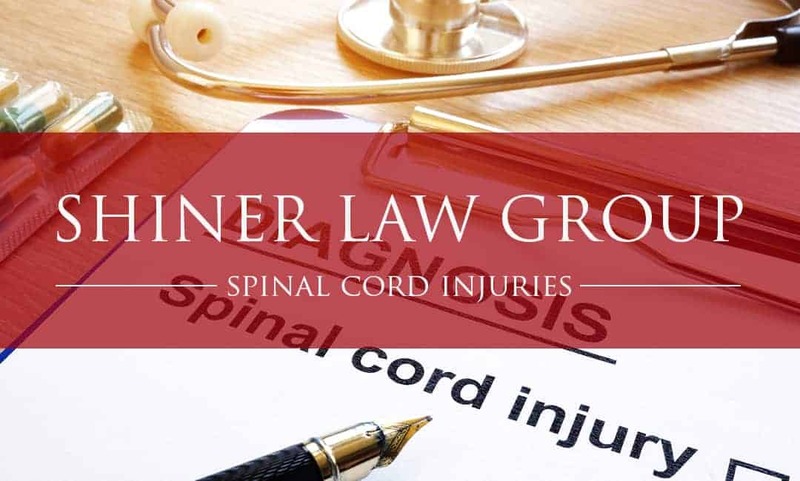 If you want to file a personal injury claim for a spinal cord injury, contact Shiner Law Group. Our experienced personal injury attorneys have handled these kinds of cases and they are ready to help you recover the compensation you’re entitled to in your spinal cord injury case.